Kochi: India’s tea business is expected to start 2009 with an overall supply gap of around 35 million kg, which should mean better returns for planters as increased production has been offset by rising exports and domestic consumption. 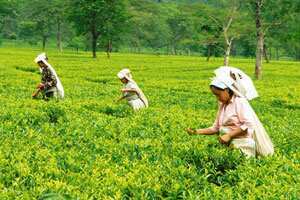 Tea production is expected to be 965 million kg in 2008 compared with 945 million kg in 2007. Domestic consumption is also expected to rise to 830 million kg from nearly 800 million kg in 2007. Import for re-export is to marginally go up to 20 million kg from 16 million kg last year, according to D.P. Maheswari, president of the United Planters Association of Southern India, or Upasi. Meanwhile, to boost exports to Egypt, a tea promotion centre is to be set up in Cairo by March with the support of Upasi and the Tea Board, according to Jairam Ramesh, minister of state for commerce and power, who was here on Saturday to inaugurate the pilot tea electronic auction project. Tea exports to Egypt have already gone up substantially from 4.5 million kg to about 18 million kg in 2008. Exports to Pakistan are expected to be in the 10-12 million kg level, Ramesh said. As part of efforts to ensure quality, the Tea Board proposes to have mandatory pre-shipment testing of tea samples being exported to Egypt, Banerjee said. No decision has been taken yet to make these tests mandatory for all shipments below $1.75 (about Rs85.50) a kg. As for the tea replantation and estate rejuvenation programme under a special purpose tea fund, Ramesh said progress has been satisfactory in the northern belt of West Bengal and Assam, though in Tamil Nadu and Kerala the response has been poor. The target is to cover 11,000ha, of which 3,000ha are in the south. About 40% of the target has been achieved in the south while it is at least 60% elsewhere.